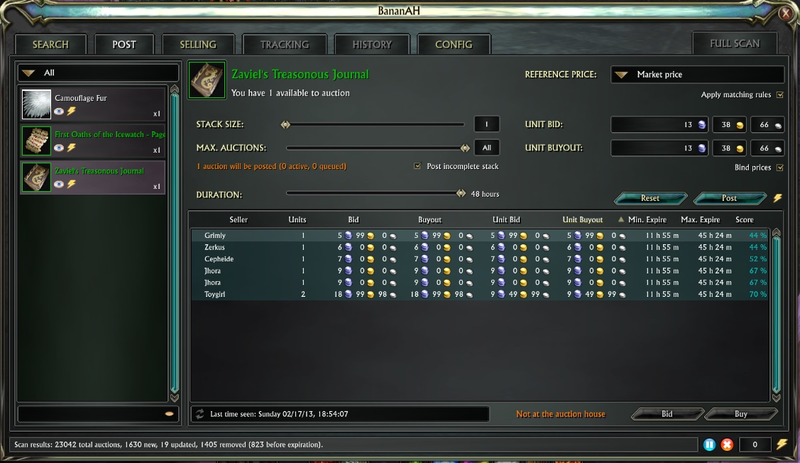 Auction house addon for RIFT. + Search auctions matching your search criteria both online and offline. + Provides several searchers in addition to the Basic one, which emulates the native AH behavior. Check LibPGCEx for more info on adding custom searchers. + Allows saving search parameters to reuse later. + Added Category filter to the item list. + The "Number of auctions" slider behavior has been changed to allow more expressiveness when setting up Autoposting. + Added "Reset" button that resets posting parameters to those configured for the item's category. + Moved out of the Post tab, to the bottom right corner of the addon window, available from any tab. + Now shares the same posting parameters than "normal" posting. + Items with Auto posting enabled will show their new lightning icon in full color, those with Auto posting disabled show the lightning icon grayed out. + The lightning icon on the Post tab allows to toggle Autoposting on/off with the currently introduced posting parameters. + The lightning icon on the Item List allows to toggle Autoposting on/off with the default posting parameters for the item's category (as if you had pressed the Reset button before enabling autoposting). + Autoposting will be deactivated upon item selection if the reference price isn't available. + Autoposting will be deactivated if any parameter is changed in the Post Tab, or when pressing the Reset button. + Many changes and additions for the new features. + Added Prices section which allows tuning pricings for each item category independently. + Added poweful Price model editor in the Prices section. + ImhoBags: Right clicking on items can now interact with the Search, Post and Selling tabs. Care: if you're on other tab or the BananAH window is closed, the item will be used as usual. + Docker: If Docker is installed, the MiniMap button will be added to it. - Externalized Auction DB to LibPGC. - Externalized item price calculations to LibPGCEx. - Externalized GUI library to Yague. - Fixed all known bugs and performance bottlenecks. - Added item filtering functionality to the items panel. - Improved the posting fields and added an option to bind bid & buyout prices. - Added basic and statistical pricing models (User defined, Vendor, Average, Standard deviation, Median and Trimmed mean). 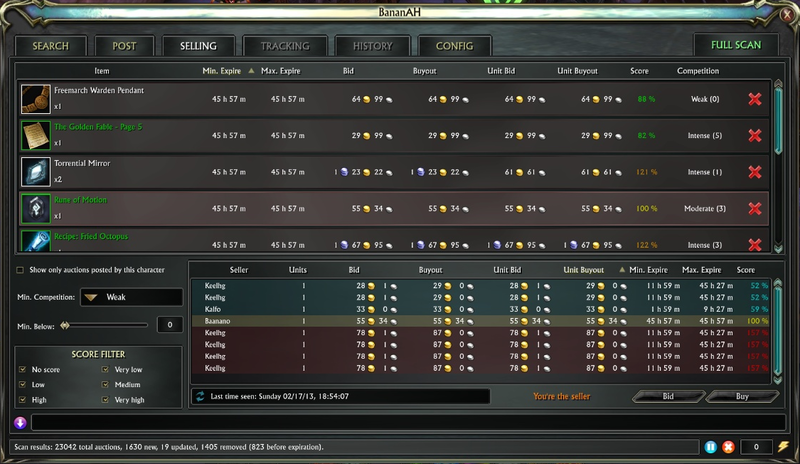 - Added "undercut on right click" to the auction panel. - Added posting queue management functionality. - Added (optional) map icon and configuration tab. I'm assuming this addon is dead? Anyone figured out how to change the Post Duration from 12hr, 24hr, 48hr to 12hr, 48hr, 7day? Looks nice but is unusable because there isn't any detailled documentation. So one can't figure out how to tell the addon to post units a certain value in percent under the lowest price found for bid and buyout. Everytime I want to sell, i.e. heavy leather, the addon puts the price at a incredible expensive price so I need to alter every price not sure if this is right or not. Mostly I am getting back every item I've posted with Banana. And I accidently set up a reference price entry that is red and can not delete it. The delete button is disabled. Last edited by WulleBulle : 03-08-14 at 05:38 AM. Just for reference, the reason BananAH can't see apothecary recipes is that it has a reference to "crafting recipe alchemy" in its tables, which should say "apothecary". I've decided to take a break off playing RIFT and addon development. Working on this addon has been a great experience, and I'm really grateful for your continued support and feedback. Should anyone want to continue development, feel free to fork the project and salvage what you can from it, no attribution needed. I'd prefer to keep ownership of the addon, though, in case I come back in the future. First off a huge thanks for writing this addon, its amazing. Especially now that the harvest event is running im selling a lot of addons, i have already configured selling parameters that im comfortable with but i have a problem with items that dont sell. Every time i put them in the auctionshouse again i have to re-enter a new price (or right-click to undercut). Is there any way to have the addon use my price rule over the "User defined" rule? I thought about deleting the history in the saved variables folder but wasnt sure about the impact that would have. 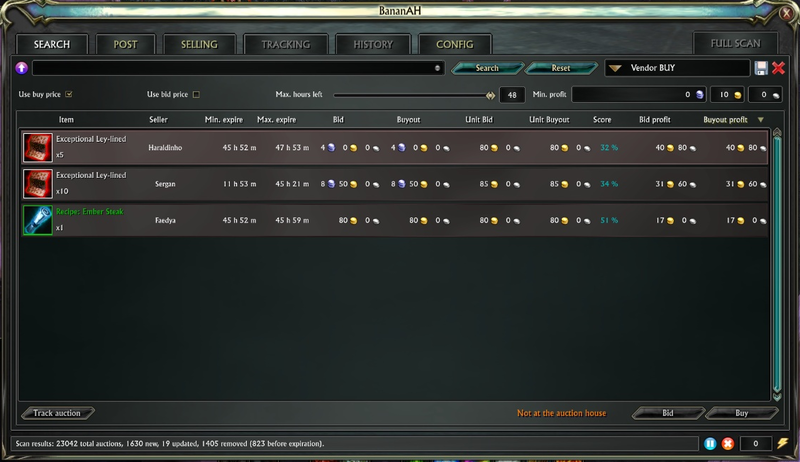 Also an auto-sell function for a whole category (ie artifacts ^^) would be nice. If you have any ideas how i could solve my problem that would be greatly appreciated. my problem is that i have found a lot (a lot) of artifacts, and when they come back a lot of them have user defined selected as the reference price. i want it to ignore what i previously entered before i figured this out and always use the undercut option. Great Addon.. Love it but I am not sure how all the features work and was wondering if there is a Doc file or Wiki for it? Thanks for you time and effort! Not right now, the latest manual was for the 0.2.x versions, and somebody posted a video tutorial on Youtube for the 0.3.x versions, but they haven't been updated since. While ingame help is one of the most requested features, I haven't had time to do it yet, and, honestly, it's low priority against fixing performance issues & adding new features. However, if anybody wants to help writing manuals, guides or documentation, just send me a PM. Any method of debugging or troubleshooting I can assist you with to resolve it? Not right now, as I've replaced the scheduler subsystem in the current development branch and any result you could get on the current stable release wouldn't apply to it. Last edited by Omegavladd : 09-13-13 at 07:09 PM. This is a searcher i've wanted to do even before the search tab existed :P The problem is that indexing items by stats adds overhead when processing a full scan, where speed is important to complete it before you close the auctioneer window and the raw auction data becomes unavailable. In the next major version, this is solved, so the searcher will become doable. Yes, I've received this bug report too on other channels, but can't reproduce it. Have you noticed if it's always the same item which kills the queue (item at the top of the queue frame)? I was wondering if you could possibly direct me to the key phrases to remove the Big and Buyout buttons from the Posting Window.